As another great year comes to a close, we're incredibly excited to announce the release of RackForms v 7.2.1, featuring the brand new Prefabs module! This module represents an important new design philosophy for RackForms, one where we build upon the incredible foundational power we already provide, but then making it easier to build more complex projects faster. Users will find the new prefabs menu just below the form elements area in the Toolbox. We're kicking the feature off with the Survey Scale item. 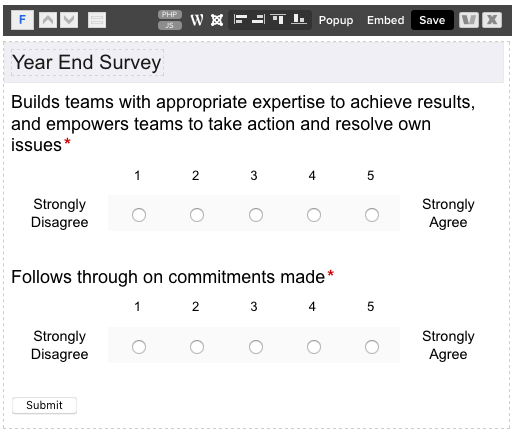 This item takes the common requirement of creating a survey item and makes it a snap to add to any form. 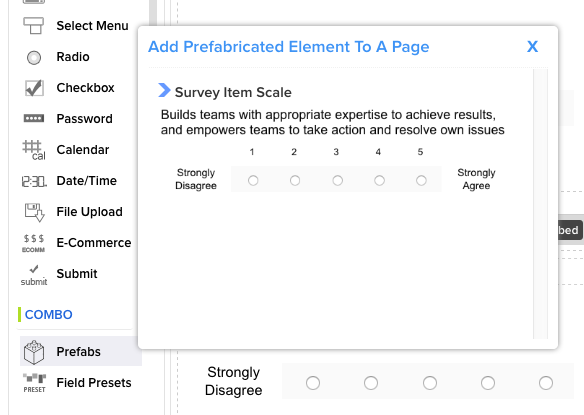 Simply click the Survey Scale item from the menu and it's added! Following the mantra of "easier", the options we have for our disposal, unlike most of the RackForms feature set, are incredibly simple. 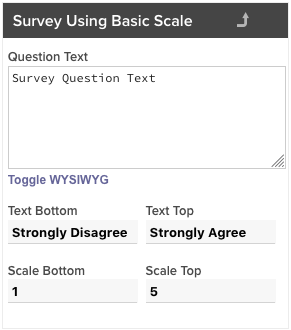 Set the question, low and high range, and low and high text values. We can then send these data items to a database, calculated via email, and so on. We're excited to see what you're able to build with this new module, and look forward to adding many more in the coming year. Happy summer, we trust you're having a great one! In this quick post we wanted to give you a quick look at two fantastic new features due to be released by weeks end. First, the ability to generate PDF templates of the current form and submit those to any destination of your chooing. Second, the AJAX module can now populate a result grid, mkaing it the perfect companion for seemless data displays in your forms. See these features in action now, and please let us know what you think! 2018 has seen a marked increase in the scrutiny of data security, from Facebook's handing of personal data, data breaches at companies like Equifax, and GDPR, it's going to be imperative moving forward that companies and individuals entrusted with data keep it secure. To that end we're proud to announce the imminent availability of fully encrypted connections for MySQL. 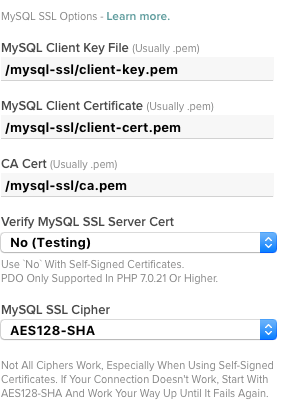 Encrypted connections for MySQL means our in-flght data is fully secured against eavesdropping, in the same way HTTPS protects web site page views in a web browser. The process happens automatically behind the scenes, and is fully transparent to your web server and network services. We've got a wide set of adjustable parameters, from key locations to the use of peer validation (useful for testing self-signed certificates), to being able to set the cipher used. These options ensure any combination of PHP, MySQL and OpenSSL versions are supported, meaning no matter what your setup you'll have full control over its implementation and security level. Data security is something we take very seriously, and we couldn't be more excited to bring these features to you in a version update later this spring!